Many were surprised by the strength of the US April payrolls report yesterday. However this should not have been a surprise. As discussed here and here, the signals pointing to US labor markets strengthening were there all along - some simply chose to keep the blinders on. The real surprise was the bond market reaction. Longer-dated treasuries sold off and rallied right back shortly after. When the dust settled, the treasury curve ended up considerably flatter vs. the prior close. 1. 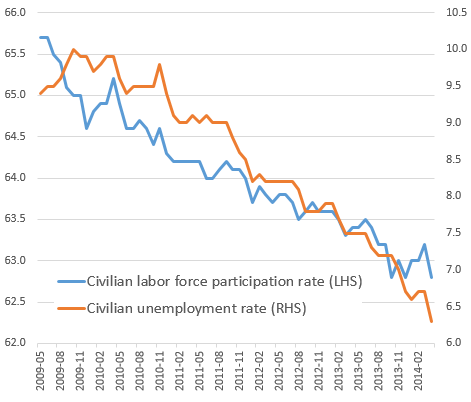 Some view last month's drop in labor force participation as a sign of weakness in the labor markets. Clearly participation is an issue, but this is nothing new. The unemployment rate dropped to 6.3% as hundreds of thousands of people lost their unemployment benefits - an effect that was in fact predicted a while back (see Twitter post). It doesn't change the fact that 288K of new payrolls were created. 2. Average hourly earnings came in below expectations, potentially pointing to the lack of near-term wage pressures. Once again, while it is not a great outcome, this measure tends to be highly volatile and does not detract from the strong payrolls number. 3. The steepener trade unwind? Some have argued that the market was positioned for the curve to steepen and the employment report forced an unwind. The pressure to exit the steepener trade would have come from the Fed rate hikes being brought forward, putting downward pressure on the intermediate maturity bonds. Perhaps. 4. A major international buyer (potentially buying for an official account) is focusing on longer dated government bonds that still have some yield - not just in the US but across the developed markets (more on this later). While a real possibility, it's unclear why this is taking place now. 5. Geopolitical risks associated with Ukraine make treasuries a safe haven investment. This seems to be a more plausible explanation, especially given the fact that gold also gained 1.3% for the day. We would like to get the readers' views on this issue. Please select one of the 5 possibilities listed above or add your own in this survey question. The survey results will be published shortly. ANZAC Day special: Can Labor be trusted to defend Australia? Weighing the Week Ahead: Why is the Market so Quiet? Chasing the next credit bubble. It feels best right before it pops. Клуб трейдеров sMart-Lab. Мы делаем деньги на рынке. Трейдера похитили чеченцы после отказа работать на преступников. Как обезопасить себя и свою семью?! Bryr sig Avanza's VD om kundernas åsikter?? Why Won't the Fed Raise Rates? Looking for the next financial bubble? Just follow the quants. Content copyright 2009-2015. SoberLook.com. All rights reserved.